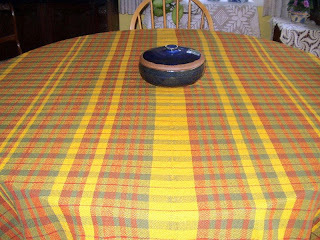 The table cloth has been off the loom for two weeks. I finally got it washed, hemmed and pressed. Overall I'm pleased. The center fold I'm not pleased with. Unlike wool, cotton is less forgiving. I had trouble finding a rhythm and when I did, I began to fret about the center fold. I can see I should have just woven. Where I thought the weft was too tight would have been just fine after wet finishing. Lessons learned. At least the inconsistent tension appears to be a design element. Sort'a. And now we know why it is recommended that there be a color change at the fold....lesson 2 learned! 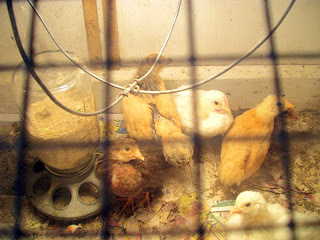 The first six chicks of the season. 75 more will arrive in early June. The seedlings are growing in the greenhouse. The garden has been enlarged to 100 x 40 and I'm waiting for the fence to go up so I can get the potatoes, peas, beans and lettuce in. However, Mr Fence Man is in the woods today cutting logs for the 2,000 mushroom plugs he just got. I ask you...priorities? The plugs can wait but my peas can't! They're vining in the greenhouse. My onions will be useless! 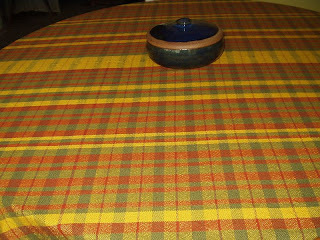 I think the tablecloth is beautiful. Suggestions on eliminating a ground hog when you can't find or get to the burrow? SS&S won't work here in suburbia, but I'll be damned if it gets another meal of my pea plants or lettuce, like it did yesterday! Hi Marie, I tagged you for a Meme in my May 17th post.